According to the Bureau of Labor Statistics, athletic trainers treat people of all ages and types, from industrial workers to professional athletes. They help prevent injuries with exercises and education, and may also be the first one on the scene of an accident or injury. Therefore, athletic trainers must be able to recognize, assess, and treat injuries on the spot. The job outlook is excellent and demand is projected to be high for athletic trainers. The Bureau of Labor Statistics estimates a growth rate of 37% (2008-2018) which is considered "much faster than average." The field is relatively small, however, so this only represents an addition of about 6,000 jobs in ten years, but the athletic training profession is definitely growing. Additionally, athletic training jobs with professional and college sports teams will remain very competitive, as most of the job growth will be with other types of employers such as healthcare facilities or corporations. Work settings and schedules vary depending on the employer. In sports settings, hours may be longer and more varied. In medical facilities, schedules may be more regular. In any setting, athletic trainers must be in good physical condition to run, walk, kneel, stand, lift, and possibly operate equipment or machines. Bart Peterson, MSS, ATC/L, has worked as an athletic trainer in a high school setting since 1988. He shared a great deal of information about a "day in the life" of athletic trainers. In addition to his primary role as an AT at the school, Peterson also serves as the school's Athletic Director and teaches sports medicine courses at a local technical college. Therefore, his days can often be long, beginning at 8:00 am and lasting until 8:00 or 9:00 pm. However, he doesn't mind that the hours can be long at times. "My profession is my passion," Peterson states, echoing the sentiments of many devoted healthcare professionals. According to the National Athletic Trainers' Association (NATA), athletic trainers hold a minimum of a bachelor's degree, while many have master's degrees, with a major in athletic training. According to NATA, 70% of certified athletic trainers are master's prepared. Unlike personal trainers, which have no standardized credentialing requirements, the official credential for athletic trainers is the ATC: Athletic Trainer, Certified. Certification requires a bachelor's degree and candidates must pass a comprehensive exam which tests in six practice domains including injury prevention, clinical evaluation and diagnosis, immediate care, and professional development. This certification is bestowed by the Board of Certification (BOC) and is the only AT certification recognized by the National Commission on Certifying Agencies. According to NATA, the average annual income for athletic trainers is $41,000. For people with ten or more years of experience, the average income is $47,500. 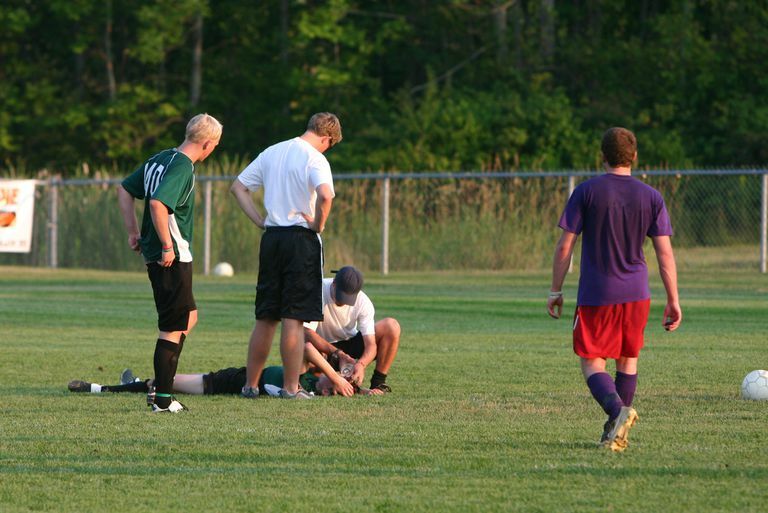 Most athletic trainers work full-time and therefore receive benefits in addition to salary. Peterson provided some insight into what he enjoys most about his career. "What I like best about my profession and career as an athletic trainer is that I have been blessed to work with people, mainly high school age students, who want to succeed. They are driven to work hard and that makes my job easy. I love watching someone overcome adversity to achieve goals." He adds, "helping others brings me great satisfaction, and the profession of athletic training provides this opportunity on an hourly basis. Assisting coaches with their responsibilities, administration with theirs, and mainly my students with their goals!" Working as an athletic trainer does come with its challenges. In addition to the long hours, Peterson shared some of the toughest things about his career as an AT. "Probably the greatest heartache comes from seeing an athlete I have come to love and respect have to deal with an unfortunate injury which will affect them for the rest of their life." Peterson adds that he has witnessed some "catastrophic and career-ending injuries and illnesses" in some of his athletes, which is trying. "Telling them that the best thing for them is not what they have worked so hard for is very difficult. However, working with them to overcome as best they can has been one of the most rewarding experiences as well," Peterson states. Does this profession sound intriguing to you? If you are interested in pursuing a career in athletic training, Bart Peterson was kind enough to also share some great tips based on his long and successful career in the profession. Learn all you can, as much as you can. Don’t let a day go by that you take advantage of an opportunity to learn and grow as a professional. Act the part: the profession is not one that allows one to live in gym shorts and a t-shirt. Live it, love it! You are either all in, or you’re not. Realize that Athletic Training is not a 9-5 job. Your hours are dependent upon co-workers (coaches) and administration and the athletes you are being paid to assist. We are a behind-the-scenes, backstage profession. You are most often not going to get the thanks you deserve, even when you have earned it. However, being an athletic trainer is about allowing the spotlight to focus on others and helping them to look good in it. Work is not easy, no matter the profession. I, however, don’t go to work, I go to play. I am blessed to do what I Iove and I get paid for it! Working with others requires compromise on the part of both parties. Just because you have a degree doesn’t mean that they will just give one what they want. We have to earn the respect of our co-workers, parents, administration, and employers.